Verizon activated a record number of iPhones in its fourth quarter — 6.2 million. It was the carrier’s strongest quarter for iPhone sales since it first began offering the handset in 2011, one in which Apple’s handset accounted for about two-thirds of its new smartphone activations. The iPhone 5 was a key driver of these sales, but not just for its promise of 4G LTE speeds and Apple’s latest handset design. 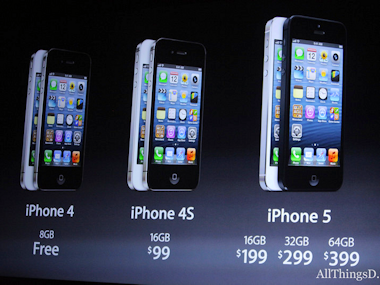 Its debut on Verizon allowed the carrier to offer the iPhone 4 free-on-contract. Fielding questions at the Deutsche Bank 2013 Media, Internet & Telecom Conference this week, Verizon CFO Fran Shammo said the iPhone 4 drove a lot of the company’s fourth-quarter activations. And just as the iPhone 5 helped spike LTE subscriber numbers, so, too, did the iPhone 4 drive 3G subscriber numbers. That’s a point worth noting. By offering less-expensive legacy iPhone models along with the latest iteration of the device, Apple is expanding its addressable market. A smart move. The caveat here is that those lower-priced models will inevitably grow their share, as well. And that may have implications for the company’s revenue and profit, because a free-on-contract iPhone 4 compresses the iPhone’s average selling price.